Exciting news for indie manga nerds... Last Gasp will be releasing a new book by Junko Mizuno this Fall! Not too many details on Amazon, but it looks like the book is 172 pages and scheduled for September 2009. This book is the first volume in a short series, and will add to the list Mizuno titles in English, PURE TRANCE, HANSEL & GRETEL, CINDERELLA, PRINCESS MERMAID, and HELL BABIES. I don't know the exact details, but I believe Patrick Macias & Izumi Evers' jaPress did the translation/editing for this book. More details and images from the book as I hear about them! Yeah, Izumi and I worked on this! Thanks for the shout out! I am looking foward to it!! I dont have any manga of junko mizuno, and I am always interested in buying something! !this is a great opportunity!! apart from this I hope ryan and evan are working on some manga for this year! !Maruo or Kago whatever!! great news from last gasp! !Interesting that they are always looking for bizarre or underground artists! Completely unrelated to this latest post: at the video store earlier today and saw the box for the Tokyo Zombie movie with Tadanobu Asano, co-starring Kazuo Umezu?? Have you seen this/is it good? We would've rented it but it was out. Was this blogged about and I completely missed it? @azraelito: Should be interesting to check out. I don't know anything about the book-- but it sounds more up my alley than the ones tackling fairy tales or the pure trance book (which was originally done for a bunch of CD booklets and really jumbled). 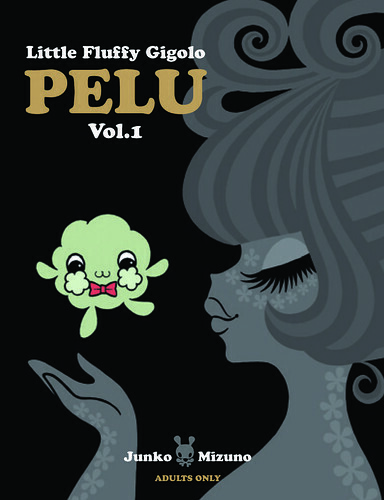 informed sources know there's a new junko mizuno book on the shelves already - published by a real man's publisher! Personally, I don't get too excited about Junko's art on its own- it's still a very late 90s/early 2000s sort of kitsch to me. But I am curious to see what she does with a narrative... aka can she tell a good story with Pelu? I'm interested to find out.